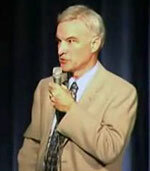 Dr. Michael Brickey’s keynote speeches and seminars help people grow young and live on purpose. He teaches “The Anti-Aging ABCs®” (Attitudes, Beliefs, and Coping Skills) for living longer, healthier, and happier. He helps workplaces turn “Grumpy Old Men” into more positive, youthful colleagues with reduced sick leave, health insurance utilization, and employee turnover. His book, Defy Aging, has been featured on Oprah, CNN, and the Voice of America. It was a Finalist in ForeWord magazine’s Book of the Year awards. Critical acclaim comes from cancer guru Dr. Bernie Siegel, American Academy of Anti-Aging Medicine President Dr. Ronald Klatz, feminist Dr. Betty Friedan, men’s movement leader Dr. Sam Keen, and four past presidents of the American Psychological Association. His book 52 baby steps to Grow Young was a finalist in the 2006 Fresh Voices and the 2006 Best Books awards. Endorsements have come from Art Linkletter, Nido Qubein, and six past presidents of the American Psychological Association. He also is a skilled hypnotist whose Reverse Aging CDs help people effortlessly absorb ageless concepts and grow young while they drift off to sleep at night. His life makeover coaching was featured in six issues of Let’s Live magazine. Further information is on his website www.DrBrickey.com, where you can get a free subscription to the Defy Aging Newsletter, which has practical advice on how to defy aging. Previous distinctions include: Editor The Independent Practitioner, Certified Alcoholism Counselor, ASCH Certified Hypnotist and Hypnosis Consultant, Fellow in the American Association of Mental Deficiency, developing and serving as Training Director for what was the only APA approved Doctoral Psychology Internship program sponsored by a private practice.